A recent post over at Poison Your Mind got my attention. In it, nickgb ponders the assertion that we are all investors. Romney’s opponents seem to be aghast that he has made money for investors (aren’t we all investors? ), though they studiously ignore other greed-less facts: He never took a dime in salary for heading the Olympics in Salt Lake City nor as governor of Massachusetts, to mention a couple. Those latter sentences are pretty stupid, because obviously Romney received gains from both of those ventures (both in reputation and financially). But aren’t we all investors? Who says that? Who still gets credit as a journalist after saying something like that? In fact, the rate is depressingly low. And even if we excuse the low number due to the economy the highest we’ve been is 67% back in 2002. A revealing bit of data to be sure. 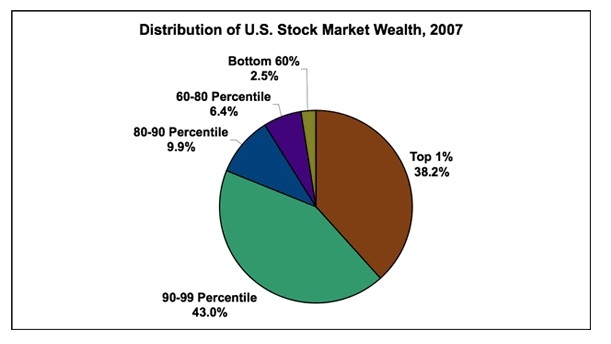 One more in the collection of charts that show the distribution of wealth is skewed. However true that may be, the chart directly above doesn’t speak to investment participation. At first I was struck by nickgb’s critique of the article, surely no one expects the reader to think that literally ALL of us are investors, but then when I saw the graph by reflectionephemeral, I was more struck by the thought process that would cause one of us to show data that explains the unequal distribution of wealth as the unequal distribution of risk. Is it possible that as we all discuss this thing we call politic that we have failed to establish basic assumptions, have failed to agree upon a basic set of accepted bedrock givens? I have full faith that the fellas over at PYM have the best interest of “folks” at heart. I like to think that I do too. Why is it that the two of us would take so different paths in responding to nickgb? This entry was posted in Economics, Politics: National and tagged Investment, Kathleen Parker, Washington Post. Bookmark the permalink. I might be missing your larger point here and glomming onto/imagining a smaller one, but are you arguing that the current distribution of wealth is a natural & necessary consequence of our society’s distribution of risk? It seems to me that we’d need to define “distribution of risk”, and compare our current distribution of income & wealth to where it’s been in the past, and that of other comparable countries, to see if that’s the case. But like I said, I might be missing the larger point here. The larger point is that I believe you are earnest in your desire/hope for a better place for all of us. And that you are an extremely able individual. I don’t know why, in response to nickgb, you would post data that describes wealth disparity and I post data that shows who actually owns stock. I think that there must be a fundamental difference in how we approach some of societies issues. are you arguing that the current distribution of wealth is a natural & necessary consequence of our society’s distribution of risk? So, if you take your data and mine and consider them together. Yours show stock market wealth. And the money piece is the bottom 60%. They only have 2.5% of the market wealth. However, when you add mine to that equation we see that 35% of the folks don’t even get in the water. Anyway, I’ve been spending the past few days wondering at how very intelligent folks, you guys, personal friends of mine, co-workers, can arrive at so different places given the same starting point. There must be a fundamental way we look at the world that’s different. As in, so different we’re answering different questions. I don’t know why, in response to nickgb, you would post data that describes wealth disparity and I post data that shows who actually owns stock. It seems to me that both things we posted are relevant ways of understanding “who actually owns stock”. I didn’t mean my chart to be the alpha and the omega of what we know about stocks. In fact, I felt like I was uncharacteristically vague as to policy in my post. I only addressed the rhetorical point you hear sometimes– “yes, all those people got laid off, but it’s to the benefit of the shareholders”. Which, as my chart shows, is a sleight-of-hand way of saying, “yes, some relatively less-well-off people came out ahead. But you must bear in mind that it helped some already-wealthy people get more wealthy”. I didn’t say, “therefore there should be a law against layoffs”. And I didn’t address the comparative advantage point, the lower cost of labor abroad, and what that does for consumer goods in the US, and therefore what the average American can afford. I’m generally a free trader. These things are complicated. I’m not even seeing how we “arrive at so different places”, to be honest. I just made the point that the vast bulk of stock value is concentrated at the top. It’s one chart that provides useful perspective, not the beginning middle and end of the discussion. Now, in this post, I’m not disputing the data or the fact that you used it. I’m just commenting on my fascination that you did while I never would have. Like I said, I’ve become very interested in how very capable individuals see very different answers to the same question. RE has already chimed in here, but for what it’s worth I do think he and I approach the problem very differently. For example, you’ll notice that I actually posted the exact same graph you did in the comments to his post (in response to another person who was arguing the same thing). I think the difference boils down to the fact that, at heart, he’s more worried about policy and I’m more interested in cross-examination. Technically speaking, the data he posted are not a rebuttal to Parker’s point. Every single American might own a single piece of stock and his chart would still look the same, but Parker would be technically correct. The graph I put up proves that she’s wrong on that literal level. But RE doesn’t care as much about, as Sarah Palin would put it, the gotcha. The data he goes to shows the fundamental problem Parker has, because we all know she didn’t mean “All of us own at least one piece of stock,” which is the literal statement she made. She meant “don’t we all understand the idea of taking wealth, giving it to someone to make it grow, and trusting that person to do that without regard to other factors.” As RE’s data show, most Americans do not participate in the stock market at that level. The stock market is largely a plaything of the rich, and even if all of us were investors it would be at a minuscule level. Private equity firms, like Bain, are vastly more exclusive. So, RE’s post shows that Parker’s point could technically be true but she’d still be deceiving. I like to nail a person down to the words they said. RE likes to nail a person on their ideas and sentiments, even if not exactly their literal expression. I don’t think it speaks to much more than a different focus, but that’s an interesting difference. It’s one of the reasons I like getting to write alongside him. For example, you’ll notice that I actually posted the exact same graph you did in the comments to his post (in response to another person who was arguing the same thing). Technically speaking, the data he posted are not a rebuttal to Parker’s point. Every single American might own a single piece of stock and his chart would still look the same, but Parker would be technically correct. The graph I put up proves that she’s wrong on that literal level. The data he goes to shows the fundamental problem Parker has, because we all know she didn’t mean “All of us own at least one piece of stock,” which is the literal statement she made. She meant “don’t we all understand the idea of taking wealth, giving it to someone to make it grow, and trusting that person to do that without regard to other factors.” As RE’s data show, most Americans do not participate in the stock market at that level. The stock market is largely a plaything of the rich, and even if all of us were investors it would be at a minuscule level. Private equity firms, like Bain, are vastly more exclusive. So, RE’s post shows that Parker’s point could technically be true but she’d still be deceiving. I do think that her point is off some. It seems like she’s trying to say that layoffs aren’t always bad because “investors want to see increased value.” However, I doubt the people losing their jobs own stock in the company. Or, if they did, would rather, on balance, would rather own the stock AND keep their job. A stronger point, one that I have hinted before, would be that independent of Bain and Romney, those folks were gonna lose their jobs. The difference comes in to play by saying that ONLY those folks lost their jobs, Bain saved the others. And in some cases, Bain went on to make that company much stronger and folks were actually hired later. It’s one of the reasons I like getting to write alongside him. The question from the Gallup Survey isn’t very good. My guess is that a modest proportion of people would not understand how their money is invested. There is better evidence from the Federal Reserve’s triennial Survey of Consumer Finances, which asks about financial assets and liabilities in a much more comprehensive way. The results from the 2010 survey are available at http://www.federalreserve.gov/pubs/bulletin/2012/pdf/scf12.pdf . If you go to Table 7 on page 41, the Fed estimates that about half (49.9%) of families had money directly or indirectly in the stock market in 2010. The same Table shows investment participation. Among households in the bottom quintile of the income distribution, only 12.5% held stocks directly or indirectly. The percentage rises to 30.5% in the second lowest quintile, and is over 50% in each of the higher quintiles. Dr. Ribar! Good to see ya again. My guess is that a modest proportion of people would not understand how their money is invested. You would think they understand that; or at lest I HOPE they would. For my part I know that I invest in funds not direct stock. However, I don’t have a great deal of knowledge concerning those funds…. If you go to Table 7 on page 41, the Fed estimates that about half (49.9%) of families had money directly or indirectly in the stock market in 2010. Yup, which supports nickg’s point. Again, I’m struck by how low that number is. 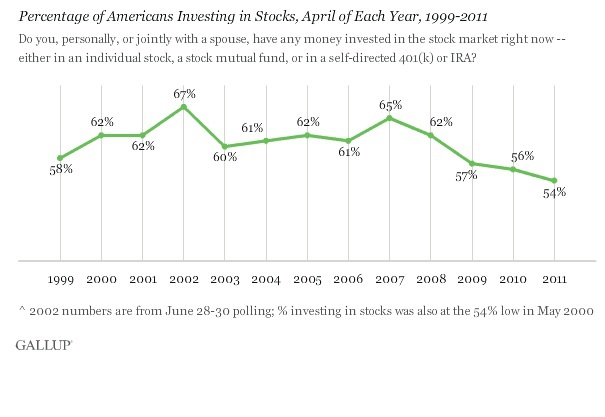 Even for those wealthiest Americans, I can’t believe they don’t invest in the market in some way. It would be interesting to dissect this more. For example, do the poorest among choose not to invest because they don’t have the money, don’t know about the power of the market or because there is a characteristic that drives poor fiscal planning AND poor work/reward outcomes? Hooray, that’s great data, thanks for the link. As to the overall post here, I’m still not entirely sure what we’re disagreeing on here. For what it’s worth, I haven’t always been especially interested in inequality. I can recall, up to maybe 2 years ago, saying, “I don’t care about inequality. I care about the number of people in poverty, and people’s ability to get out”. But as it happens, the last three decades have been an era of increasing inequality, which has implications for mobility, and our politics. It cuts against my free-market ideology to be preoccupied by inequality; but we are where we are. I love the determined absurdity of that phrase, but it’s like my whole perspective. Ten years ago, I was a centrist type, thought that the SC picking Bush over Gore was not great but not awful, thought that invading and occupying Iraq was a good idea, was considering voting for Bush in 2004, hoped his fiscal policies would work, thought the centrism from the Post and Times and NPR was the height of wisdom, etc. But then reality got in the way. I wish that the Republican Party weren’t insane, that the media weren’t terrible at reporting the news, that inequality didn’t matter. But alas, here we are. I’m still not entirely sure what we’re disagreeing on here. We aren’t disagreeing on anything. My whole point is that I’m fascinated how we all contemplate nickgb’s original point. Nothing more.